3.7 out of 5 based on 54 bloggers and 9 commenters. 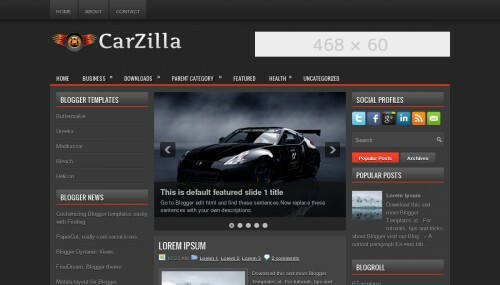 CarZilla is a free blogger template adapted from WordPress with 3 columns, left and right sidebars, ads ready, slider, social bookmarking icons, posts thumbnails, tabs and drop down menu. 1. Upload photos into the slide/change the text/link to post. 2. Make the pages work. Can anyone help with this? Where to I click? Any assistance with this would be MOST appreciated! how to change drop down menu categories? Hello, I would like that same template posts without thumbnails. oh nó rất đẹp. thanks you.